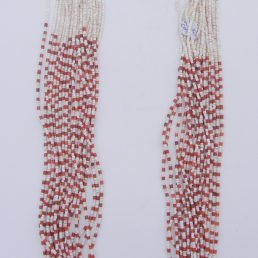 An elegant turquoise bead necklace is the perfect piece of jewelry for collectors of handmade Native American Indian art. Available at Palms Trading Company in Albuquerque, these beautiful necklaces are intricately designed to highlight the cultural traditions of the Southwest’s tribes and Pueblos. Shop in-store or online and discover our exclusive selection of handcrafted necklaces created by artists from the Navajo tribe and Zuni and Santo Domingo Pueblos. 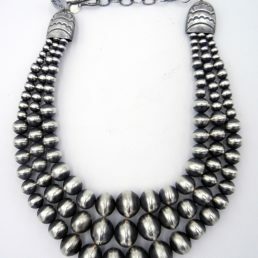 The Santo Domingo Pueblo is famous for its heishi, or ‘shell’, jewelry. 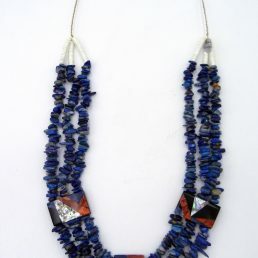 Each of their unique pieces display beautiful stonework that embodies the traditional Native American Indian jewelry techniques used prior to European influence. Along with shells, these artists use either polished beads to create color-block patterns or uneven stones to create a textured appearance. 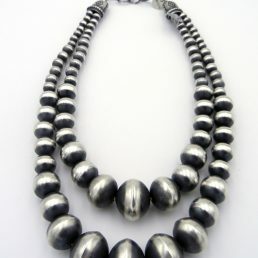 Necklaces are the most common pieces of heishi jewelry. Santo Domingo artists’ turquoise bead necklaces feature beautiful blue turquoise gems, olive and other shells, and sterling silver cylinders. 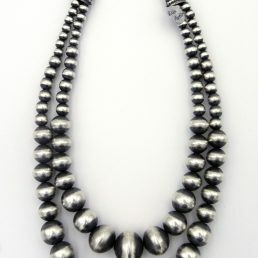 Since the 1970’s, these bold yet elegant necklaces have been a popular item for women who enjoy the distinctive style only found in the Southwest. 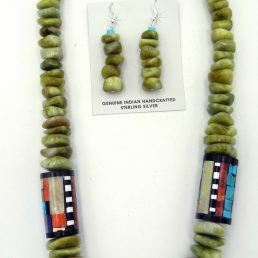 Jewelry created by the Navajo tribe often features chunky turquoise stones set in sterling silver bezels. 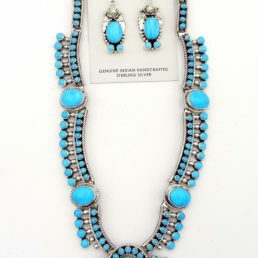 As one of the largest Native American Indian tribes, the Navajo Nation’s characteristic silver and turquoise jewelry designs are cherished throughout the world. 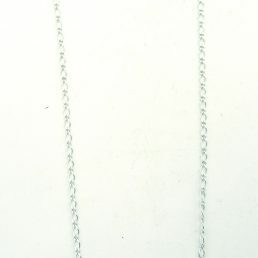 Palms Trading Company is proud to carry a variety of their renowned sterling silver and turquoise bead necklaces. 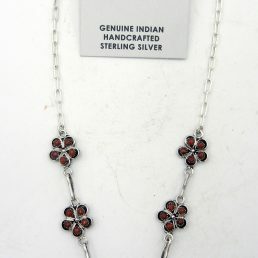 Among our most popular items is the squash blossom necklace, a traditional Native American piece that has become a symbol of the Southwest. 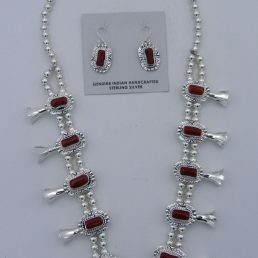 Dazzling turquoise gems, striking red coral pieces, and polished sterling silver come together to create fabulous pieces of jewelry that showcases centuries-old Navajo craftsmanship. Our selection also features other traditional and contemporary designed necklaces, earrings, rings and bracelets from the Navajo Nation. 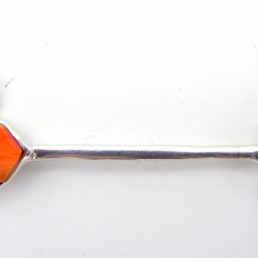 For over 60 years, Palms Trading Company has worked together with New Mexico’s Native American tribes and Pueblos to bring their unique jewelry pieces to a global audience. 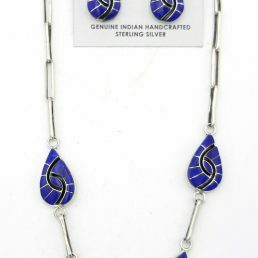 Our strong relationship with Navajo and Santo Domingo craftsmen, allows us to provide our customers with authentic Native American Indian jewelry at fair and honest prices. Visit Palms Trading Company today and enhance your style with a unique handcrafted turquoise bead necklace.